The Writing is Delicious . 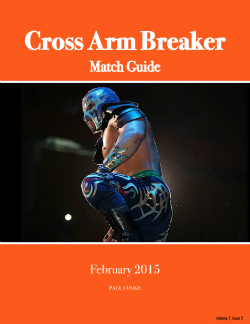 . .
About the Cross Arm Breaker Match Guide: The ultimate goal of the Match Guide is to provide prospective and analysis from the wide ranging spectrum of matches that are occurring all over the world in 2015. From a small independent promotion such as Cara Lucha in Mexico to the Japanese leader New Japan Pro Wrestling to WXW in Germany, you will find original, analytic content about the best, worst, and the in between. We hope that these monthly, longer form pieces will spark debate and discussion and add to the current conversation that is so readily accessible via blogging and social media. And much, much more including Daniel Bryan/Roman Reigns, Harashima/Ibsuhi, and full star rating index of February matches reviewed at CrossArmBreaker.com! We are offering four versions of this e-book. We recommend using iBooks, the Amazon Kindle App on your tablet of choice, or a PDF viewer on the tablet of choice for the best reading experience. The quality when using Option 3 will also change depending on what size the font is in your reading app/device. 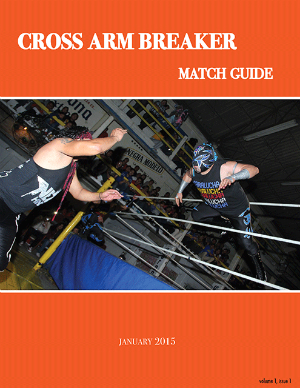 If you have not yet had a chance, please check out the January Match Guide which can be downloaded for free right here! In this issue, we looked at the main events of New Japan’s January 4th Tokyo Dome event, the value of a quality handheld, the tradition of lucha libre in Japan, and much more!